We handle a myriad of personal injuries cases. My firm handles automobile accidents such as Rear-End and T-Bone collisions, trucking accidents, spinal cord injuries, head and brain trauma, nursing home negligence, elevator/escalator injuries, wrongful death, construction negligence, workers’ compensation, workplace safety violations, slip and falls, train accidents and airplane accidents. Every area of personal injury law can be viewed from the perspective of the severity of damages. The better the presentation of damages, the better the chance of recovery that is fair and just for our client. What Interested You In Practicing This Area Of Law? My answer in one word is “fairness!” The insurance industry is professional in collecting profits from the fears of our citizens. However, the insurance industry is not “fair” when it comes to distributing fair and equitable awards to those that are injured. The state’s insurance commissions have tried to put control on those agencies issuing policies within the state, but just as fair to say have not gone far enough to protect the consumers. Insurance companies are great marketers and lobbyists. You see them on television exclaiming the greatness of their companies; your representatives see them in Washington, and within the state capitols bearing expensive gifts. What Are The Top Misconceptions About Working With A Personal Injury Attorney? The common misconception is what the public has been led to believe. Lawyers have been held in disdain for centuries. It’s hard to take some of the jokes well placed by those who don’t want to get lawyers involved. They cry out the lawyer’s greed, corruption, self-interest, and almost anything negative to shift the focus as to the true need. Lawyers serve an important role in society. Literality nothing changes without a lawyer. Everything seen and unseen is regulated and placed into motion by lawyers; and by those who actually and actively practice the law. Personal injury attorneys are needed precisely for this role. To resolve conflicts, to collect fair damages for their clients’ injuries; to hold accountable the wrongdoer; and to advocate and be counselors for the client in their time of need. What Are The Top Misconceptions About The Personal Injury Recovery Process? The biggest misconception is the amount of time it will take to resolve a personal injury claim. Nothing worthwhile is ever easy. Beware of the quick settlement offers to resolve your case. This simply means that the insurance company realize they are at risk to lose much more. 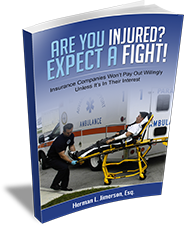 Therefore they quickly offer little to placate the injured but at the same time getting a complete release of liability for any resulting injury from that accident. In other words, you may have a sore back and the insurance company quickly settles with you for a small amount of money. Later you find out that that very same injury has caused a serious back injury that requires surgery and future restricted mobility. Too bad, according to the insurance company, you have already settled. These are things you don’t hear about over the television with their happy and smiling faces. The other misconception is that you don’t need a lawyer, or somebody else’s lawyer got more for the same claim. Free advice is probably the worst advice. Too often apples are compared to oranges and thus can’t be really can’t be compared. Don’t ever try to settle a case without a lawyer. Studies show you are likely to recover anywhere from five to six times more with a lawyer. In addition, keep in mind my discussion on future damages. Prudence demands to have a lawyer. Never give a taped statement (a personal injury confession) to an insurance company without a lawyer. It’s only used to deny you the proper damages you deserve. Expect a fight! Insurance companies won’t willingly pay out unless it’s in their interest to do so. Again, consult an attorney before filing the claim. The insurance company has an obligation to investigate the claim and investigate it in a manner that in the most favorable light of their insured. So, don’t expect too much help from them. I sometimes amuse myself when traveling to other cities. I look up at the tallest building in town and know that it’s owned by an insurance company. They didn’t get that rich by easily giving money away. You get my point, it’s always a fight, and some come prepared. For more information on Personal Injury Cases In Missouri, a free initial consultation is your next best step. Get the information and legal answers you are seeking by calling (314) 786-3536 today. Home > Personal Injury > What Types Of Personal Injury Cases Do You Handle?